"Globally Harmonized System of Classification and Labeling of Chemicals (GHS)" is a system created by UN to address the classification of chemicals by types of hazard and harmonize hazard communication elements, including labels and safety data sheets. It aims at providing a basis for harmonization of rules and regulations on chemicals at national, regional and worldwide level, an important factor also for trade facilitation. As an international agreement GHS is non-legally binding in the member countries of United Nations. Thus many countries and regions have published their own regulations or standards to implement GHS. For example, the GHS criteria were introduced into Europe via the Regulation (EC) No 1272/2008 on the Classification, Labeling and Packaging of substances and mixtures (CLP) in 2008. China is one of many countries that have agreed to implement GHS. Chinese government has published several compulsory national standards (starting with GB) and recommended national standards (starting with GB/T) between 2008 and 2013. 16 Oct 2013, the Standardization Administration of the People's Republic of China (SAC) has published 28 new GHS classification standards for chemicals and the implementation date is 1st Nov 2014. The new compulsory national standards (GB 30000-2013) for chemical classifications are fully aligned with UN GHS Rev. 4 and have adopted all building blocks under UN GHS Rev. 4 including aspiration hazards and hazards to the ozone layer. They will replace current national standards GB 20576 ~ GB 20602-2006 safety rules for classification, precautionary labeling and precautionary statements of chemicals issued in 2006. Please note: All 28 classification standards(in Chinese) are available free of charge upon request. Please contact service@cirs-reach.com if you are interested. GB 13690-2009 General rules for classification and hazard communication of chemicals refers to above standards and requires companies to follow them to prepare SDSs and labels. China released 3 national standards related to the labeling and packaging of chemical products in line with GHS in 2008 and 2009. Emergeny number on the label must be a domestic 24h emergency telephone number. The second mandatory national standard (GB 190-2009) - “Packaging Labels for Dangerous goods" is based the 15th revised edition of the UN recommendations on the Transport of Dangerous Goods. This standard specifies the requirements of pictogram, label size, colour and packaging of hazardous goods. This standard also came into force on 1 May 2010. The third labeling standard is “Labeling of Chemicals Based on GHS” (GB/T 22234-2008). Chinese government firstly published this recommended standard in 2008, which is translated from the Japanese version of <labeling of chemicals based on GHS>. - samples of chemical labels(do not exist in GB/T 22234-2008 ) are given. It shall be noted that GB 13690 did not mention whether blank red borders of pictograms are accepted in China. CIRS recommends companies that they take a conservative approach and avoid the use of blank red frames on a GHS label for China. Please also note that GB 13690-2009 speficially mentioned that China's GHS national standards apply to both workplace chemicals and consumer products. More information about chemical consumer products labelling can be found here. 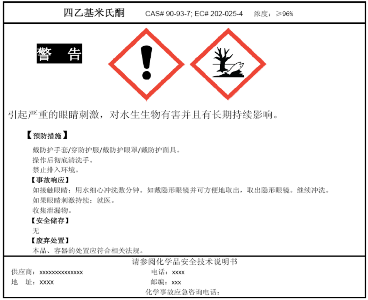 The most important national standard related to Safety Data Sheet (SDS) in China is "Safety data sheet for chemical products: Content and order of sections" ( GB/T 16483 -2008). This recommended standard was published in June 2008 and entered into force in February 2009. It specifies the structure, content and format of Safety Data Sheet in line with China GHS. The other important standard is GB/T 17519-2013 Guidance on the compilation of safety data sheet for chemical products, which was issued in Sept 2013 and comes into foce on 31st Jan 2014. This recommended standard provides detailed guidelines for SDS authoring in China. More info about this standard can be found here. Please note that 24h emergency telephone number is required for the SDSs and labels of hazardous chemicals. CIRS works with National Registration Centre of Chemicals(NRCC) to provide this service. More info can be found here. Most of the consumer products(excluding cosmetics) containing chemicals may not only be subject to main Chinese chemical control laws and GHS requirements, but also be subject to relevant product specific national standards and additional labeling requirements(format, content, font size etc). Example of those consumer products include detergents, paints, fuel additives, lubricants, air freshners, adhesives, aerosol products, disinfectants and pesticides for households, etc. In China, GB 13690-2009 General Rule for Classification and Hazard Communication of Chemicals clearly says that the standard applies to both workplace chemicals and consumer products. However, it is not clear whether China will adopt risk-based labelling approach for consumer products in accordance with annex V of UN GHS. However, GHS labelling for consumer products has become a trend as more countries or regions have adopted or recommended GHS labelling for consumer products(for example, EU and Japan). More info about our label review and preparation services for consumer products can be found here. In case of typical notification of new substance in China, Chinese SDS and classification based on above national standards shall be provided. For more information about the differences between China GHS, UN GHS, and CLP regulation, please click here. China's national standards have linked TDG with UN GHS. In Oct 2011, China has released two revised national standards for dangerous goods. Those two standards are consistent with the 16th revised edition of the <UN Recommendations on the Transport of Dangerous Goods>. Please note: Compared to other translation service providers, our price is very competitive and our knowledge with China GHS and REACH SDS allows us to translate your SDS more professionally using standard phrases. Our services cover new substance notification, registration of the import and export of toxic chemicals, registration of hazardous chemicals, classification and labeling in according to China GHS, Chinese SDS, risk assessment of industrial chemicals, food additives and cosmetic ingredients. We provide one-stop solutions to your regulatory issues in China. We also deliver the most up-to-date regulatory information about chemical control laws in China. at service@cirs-reach.com or find more information on www.cirs-reach.com.